I previously discussed the cancellation of EME Wizkid California concert which you can read here. As a follow up, I reached out to both parties with pretty much the exact same interview written questions below to share with you all. You can read the promoter’s view below. Eche/ Royal Entertainment’s View. I am yet to receive EME’s responses. AML: What is the name of your event promotions company? AML: How long have you been promoting events? 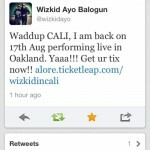 AML: How did the EME/Wizkid concert for Oakland come about? Eche: On a fine Saturday Morning July 14th to be exact, (t)he Tour Manager Valentino Bendel contacted me asking whether I was interested in bringing the show to the West Coast, Oakland, California to be exact. I expressed to Tino that I would be unable to afford their high booking fee which ranges from 20 thousand dollars to 40 thousand dollars depending on the “Mugurity level” of the promoters in individual cities. Tino then volunteered a partnership between the two of us, where we would pay for a Venue and handle expenses on our end and they handle flight expenses and accommodation on their end. And at the end of the concert, split the profits from the concert. 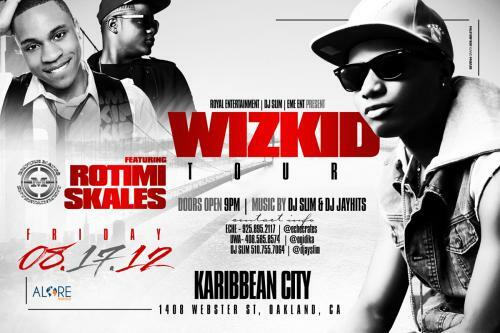 AML: How much money did you pay to EME to have Wizkid, Rotimi and Skales perform in Oakland? Are they agreeing to return your deposit fee you paid for the artists? AML: Did you and EME agree on what should happen in the event a cancellation occurs, prior to your agreement to promote the event? Eche: No we did not. And in retrospect we should have but at the time it did not cross my mind because I could not envision a scenario where they would cancel because they contacted me. I didn’t reach out to them, they reached out to me. I expressed to Tino that he should give me his “word” that the concert would take place as last year they had cancelled on us as well due to Wizkid not having his Visa. Tino gave me his word and for the next couple of weeks provided resources which helped with the promotion of the show. AML: When did you find out the concert would be cancelled? AML: What was the reason given by EME for cancelling your concert? 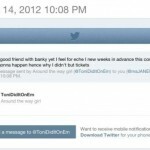 Eche: On Monday night at 11pm my time, Tino called me and said “Eche i have bad news”. I responded “what happened”. He said “something huge came up”. So we have to cancel the performance this weekend both in California and Canada. I pressed him for more info as what it could be that would lead to the cancellation of major cities on a tour? He said it was huge and he could not share it with me. But that what ever it was would boost the label’s prestige from Planet Earth to the Moon. Furthermore, he said he was on his way to D.C to get passports for both Skales & Wizkid because they needed it for the “something huge that came up”. AML: Did EME provide other alternative solutions to fix the problems? Eche: No alternative solution was provided. Tino expressed to me that “EME owed me one” and that he guarantees that the next time they are back in the U.S I would be the first person they call. AML: What exactly would you like EME to do to fix this situation? Eche: EME’s “word” as of this point is not worth a sack of garri. They broke their word in 2011 and gave me a guarantee that in 2012 they would be back. They came back in 2012 and they cancelled on us with “something huge came up”. 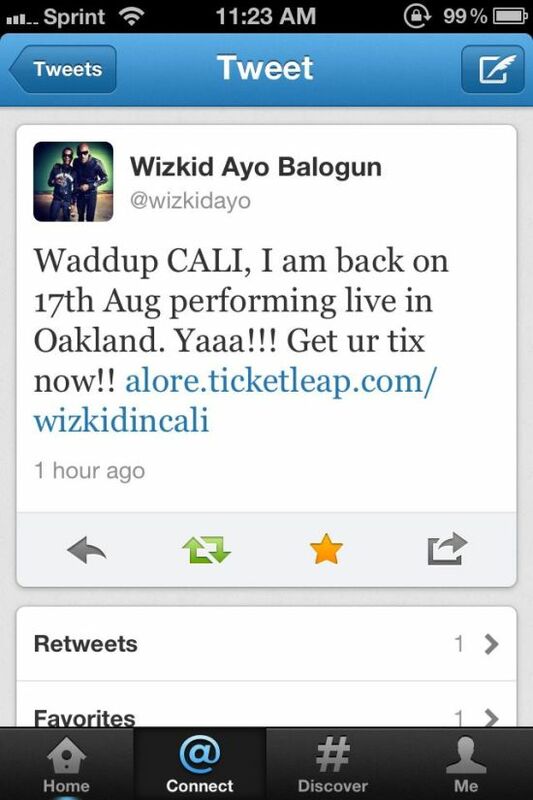 In 2011, they promised to refund tickets to people who bought tickets after Wizkid was denied his Visa, they did not. In 2012, they have promised the same thing. We want to make sure the refunds are made. Also, for we the promoters we have expenses for the show which were incurred we want to be covered for damages. Furthermore, we request that EME provide a better explanation for why they cancelled. And this time, the Truth and nothing but the Truth. We gave the best promotion for the concert that money could buy to them and they repaid us with egg on our faces. Our reputation has taken a hit, we took them at their word and they showed us their word meant nothing. A lot of people bought flight tickets to fly into Oakland California from Los Angeles, San Diego etc. There is disappointment all round and a lot of people are emotional and highly upset about it, sacrifices were made by a lot of people in order to attend the concert and to leave us with a “something huge came up” explanation is tactless. Furthermore, if whatever came up was so huge why are they still performing in D.C/ATL/Chicago? 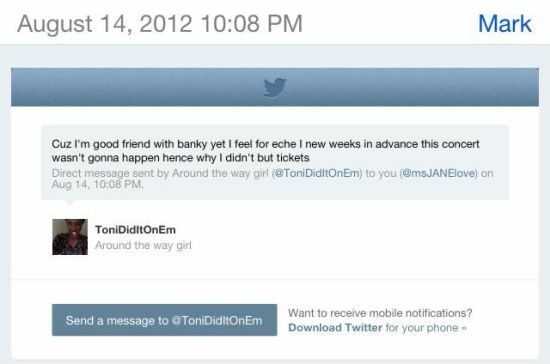 Screenshots Evidencing EME/Banky W allegedly knew the California Concert would not take place. It is not only Eze that is not happy, majority of us who are fan are not happy. We love Wizkid and we his live show.